Luke Younger’s Alter label is aptly named, given the way releases he puts out tend to manipulate and transform the very foundations of the music genres they approach. Take Basic House’s Oats, from 2013, an album with a title evoking Basic Channel and dance music but the music on which was traversed by tense industrial drones, gristly textures and an overarching atmosphere of unease. Dance music for people with a queasy stomach, maybe. Younger’s music as Helm also straddles genres, taking ambient and drone and flipping them over to reveal a noisier undercurrent upset by samples and found sounds that evoke decaying landscapes and shadowy back alleys. And so it is with String Studies, a rare foray on record into electronics by Robbie Basho-inspired guitarist Cameron Deas (apparently his real name), an album that bears few traces of the Englishman’s instrument of choice, even as it forms the basis of these eight tracks. String Studies is a tricky work to define, but I suppose it sits most accurately in the electronic category known as “glitch”, made famous by alva noto and Ryoji Ikeda on Raster-Noton. 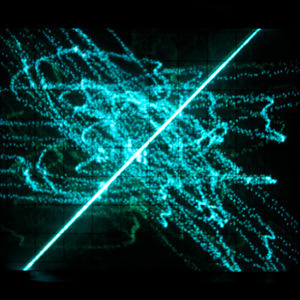 All eight tracks are dominated by sheets of scabrous, high-pitched electronic crackles, as if Deas has managed to amplify the internal sounds of a broken computer as it tries vainly to run through its programmes. Like all glitch, this is not easy music to digest, the polar opposite of easy listening, but where so much of the genre seems to these ears a bit sterile, there is something lurking under the layers of mulch on String Studies that encourages, and the rewards, repeat listens. This is almost certainly down to the source material. Deas uses samples of his 12-string acoustic guitar as the basis for each composition, filtering them through a modular system to produce what are, under the circumstances, astonishing results. The temptation is to try and strain through the gristle and crunches to try and piece together the pieces’ origins in the acoustic world, and indeed at times this bears fruit. On the second track, for example, what sounds like a solitary chord is amplified and laden with echo, its cavernous resonance piercing Deas’ synthetic textures like a tolling bell. At times, rather than guitar strings, the source sounds come across as piano notes extended and reverbed, which is a remarkable transformation and one that acts as a curveball against unhelpful expectations. Consciously or not, the listener is compelled to create his or her own sources for the sounds heard under the electronics, and it’s a measure of Deas’ control that these half-grasped intimations are often contradictory and varied, especially when one considers the minimalism of his set up. However, it’s better to draw away from the fine details and allow Deas’ music to unfurl as a whole rather than a sum of parts. Essentially, and despite a certain resemblance to Sun Ra’s Strange Strings that, I kid you not, goes beyond a similarity of title, String Studies is a sort of glitchy noise album, with the kind of massed textures that define the works of The Rita or Younger’s Helm project, albeit in a completely different style. At times, submerged by the onslaught of crippled tones, it seems that disembodied and not particularly friendly voices are calling out from beyond the scratchy ether Deas creates, at others he seems to embrace a caustic form of minimalism. String Studies is cold and abrasive, but it’s not inhuman. You just need to embrace it to find the depths Deas plays with. This entry was posted in 2015, Dusted, Music Reviews and tagged Alter, Dusted, electronic, experimental, glitch, music journalism, noise. Bookmark the permalink.